Some time in the next week this typewriter will be taken down to a post office and sent on its merry way up to Queensland. There, it will join up with many other interesting typewriters that are housed in John Lavery’s collection and at least get some appreciation. 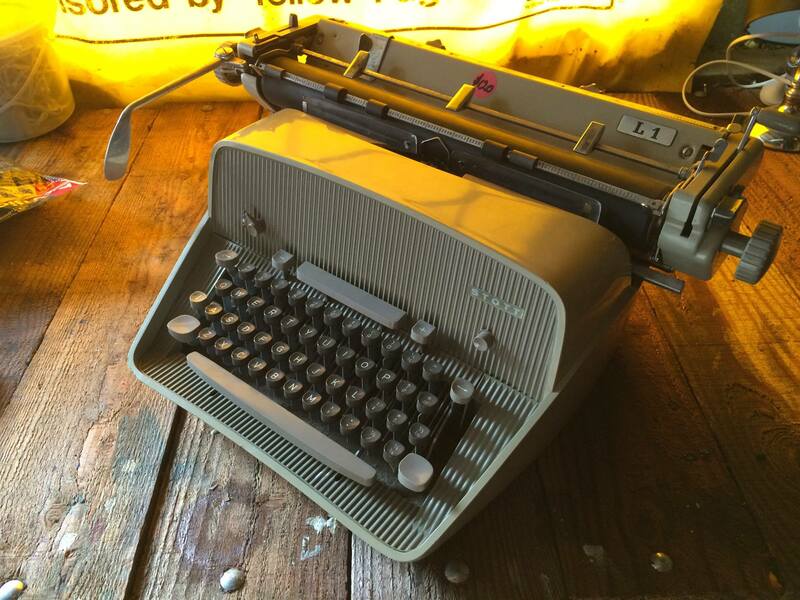 I promised John that I would send this typewriter up to him almost a year ago, after I collected it from here it had been hiding in a store undiscovered until a couple of months earlier when I discovered it while on safari with Steve Snow. John knows the former workshop manager of Stott, and I feel that his collection would be a more more appreciative home for this machine. I also think it suits his collection better, as he has a great series of mid-centry machines that this ,machine will fit nicely with – including some genuinely rare electrical machines from that era. I haven’t been intentionally dragging my heels on sending this typewriter. It’s a heavy beast with a plastic shell that could be quite fragile, and I was keeping an eye out for the best possible box to post it in. I’ve toyed with the idea of removing the carriage and sending the two separated in order to save the escapement and lessen the risk of the carriage being mangled by the entire weight of the typewriter if the parcel got dropped. But I hadn’t quite found the time to investigate that possibility – particularly as the typewriter has been boxed up (in a box that I knew wouldn’t make the journey) and put aside in storage with some other stuff, while I was in temporary accommodation after I left Melbourne. The Stott L1 is in fact a Siemag typewriter at heart, and was identified as such with much discussion with members of the Typosphere. This is particularly so as this variant even in Siemag branding is very hard to come by. 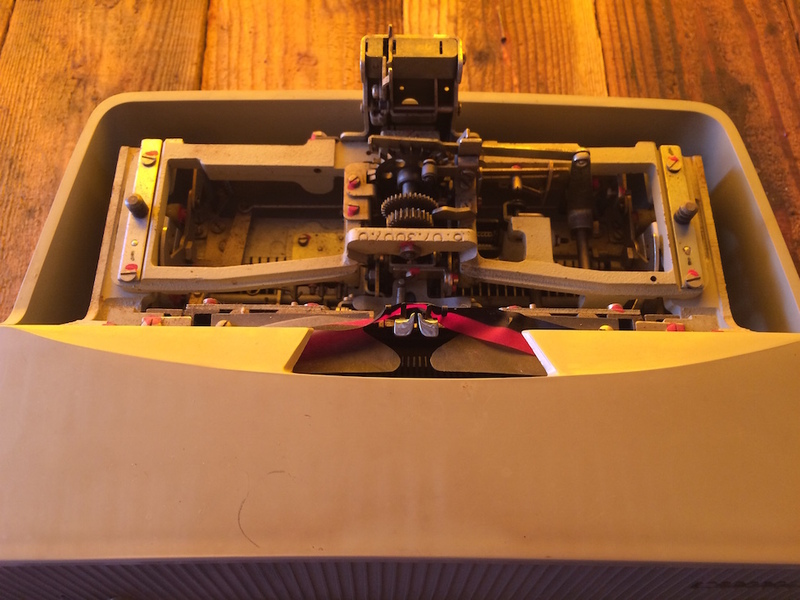 It wasn’t until I saw the Davis Brothers recent video on typewriters that can come apart, that I was prompted to look for the Siemag release mechanism that would release the carriage. It took me a few moments but I eventually found two very non-descript buttons on the underside of the typewriter that I hadn’t noticed before, which allowed the carriage to just pop right off very smoothly. Its easy, perhaps even cheap to dismiss this typewriter as just a ‘rebranded machine’. Stott was one of the big names when it came to typewriters in Australia for decades, and for at least one historian that I know of, this machine had completely passed under the radar until I uncovered it in 2014. Rebranded implies that the machine is an ad-hoc product line that a company carries to compliment their business range. The Stott L1 however was the basis of a considered business strategy with a view of distributing a new line of machines here in Australia. Calling it a re-brand is like saying that the Bijou was ‘just a’ re-branded Erika. They’re not. They were market specific products. Siemag was one of the post-war german golden era manufacturers that produced typewriters that are rarely seen outside of Europe. Indeed, Will Davis pointed out in his blog some time back that the Siemag was the very last ‘All new standard to be marketed’. I.e. while Royal and Remington were largely just re-jigging new designs on top of old platforms, the Siemag was the last desktop to be designed from the ground up that had any success in the market. This of course, doesn’t include electrical machines that came afterwards. Stott certainly thought so too. When they marketed the L1 in April 1969 they called it ‘the newest’. The number in the L1 designation didn’t relate to the model, but rather the carriage length. The Lx destination changed with the larger carriage machines. By the time the L1 was being made, Stott has transferred their manufacturing to Portugal in order to start saving on labour costs. The cast frame was redesigned again, and the shell traded sheet-metal for a ‘new age’ material referred to as plastic that allowed for complex shapes to be produced rapidly and cheaply, The case now completely housed the body in order to absorb as much sound as possible, and gave it a sort of ‘space age’ look. It borrowed heavily from Royal’s design for the Empress typewriter in this respect, and you can see design cues that have been taken from Royal’s desktops of the era. The frame has some interesting design features, while the mechanical side of this machine looks very similar to the Olympia SG1 with its compact tightness and close components. Despite this progressiveness, Siemag never really gained traction outside of Europe. Even inside they were seem as something of an also-ran. As such it is quite uncommon to find versions of this machine outside of Europe. They have been spotted in the USA under the brand name of ABC occasionally. But don’t expect to find one in your local antique store anytime soon as none have been spotted out in the wild. Which brings me to the Stott L1. If you were going to do a write-up on the history of Stott, you could almost be forgiven for missing this machine. 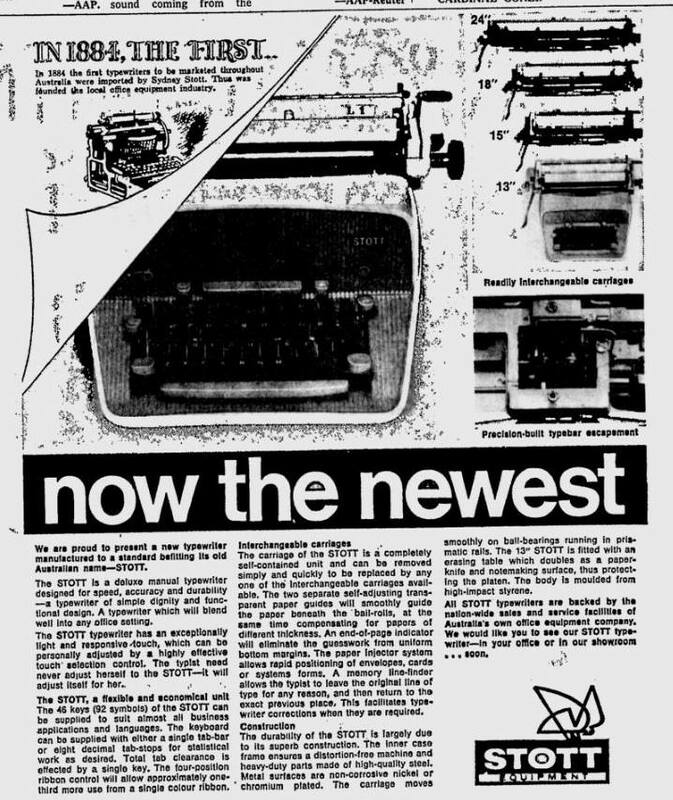 Stott advertised it for only a few days, and a couple months later the Stott typewriter business changed hands, and the era of Stott typewriters faded away as the typewriter division became a tax-writeoff that was bought up by the independently owned Stott business college in 1969. It would be foolish to dismiss the Stott L1 as a mere re-brand. It was a serious attempt at re-launching the business after Stott’s main product line, Underwood typewriters had several years earlier became part Olivetti. Olivetti had a huge presence in Australia by the late 60’s, and was slowly killing off competition in the industry, including companies like Stott that it used to sell its machines through, while IBM was aggressively taking up new market share. Stott’s business machines needed something to fill their product hole, and they needed it fast. So Stott took inspiration from how Commodore typewriters got a start, and looked to Germany to find a modern machine to re-launch their platform on while trading on their local Australian business credentials and name. Stott brought in a small range of re-branded portables for the domestic market, however Stott’s real bread and butter was the business market where they provided machines and servicing to corporate buyers and lessors. This is the market that was the main focus for Stott’s typewriter devision, and to no longer have a major marquee name such as Underwood or Royal along with their range of desktop machines to offer, Stott knew they couldn’t remain competitive and would quickly fail. So the Stott L1 was brought in to fulfil existing business contracts, and fill this the supply gap. However, In order to maintain this kind of business, you need two things – a supply of reliable machines that will attract contracts, and a service team that was trained up and capable of maintaining these machines to specification for the customer. Sadly, it appears that Stott failed on both counts. When I found this typewriter John Lavery called his friend that used to be the Stott workshop manager to find out more about this machine and was surprised to learn that he’d he had never heard of the Stott it. If your workshop manager isn’t aware for the company’s new machines, what chance does the rest of your team have? In contrast IBM and Olivetti were dominating the market at the time with well trained and organised service teams and attractive product lines. A large contributor to this problem most likely would have been the lack of machines that were landed in Australia under the Stott brand. While the L.O.C. in the companies finances indicates that the initial purchase order was around 5000 units, there appears to be no straight-forward record of how many actually arrived. 1000 has been suggested to creditors for the company when the assets were listed, however it may have been as low as 30. I originally described this machine as a rare re-branding, and if it turns out to be such a small number, then that’s putting it in extremely rare territory. Siemag was faltering as a business themselves and would stop producing desktops two years later, but Stott was not in the financial position to pursue Siemag for the unsupplied machines before the creditors moved in. It’s hard to say if this typewriter was what sank the typewriter division, or if Stott was already near insolvent when their supply-chain failed. But it could be said that this typewriter was a big nail in the coffin. Stott’s business colleges still exist to this day, but their office equipment division does not. What is most depressing about this, is that it had been a dream of the Stott corporation for decades to have an ‘Australian Typewriter’. They never got the Australian made machine that they wished for, but they briefly had a Stott Typewriter to call their own. Painfully briefly. This typewriter could be seen as Stott’s ‘Jumping the shark’ moment. As the company faded they tried their hardest to bring customers back with one last swing for glory. 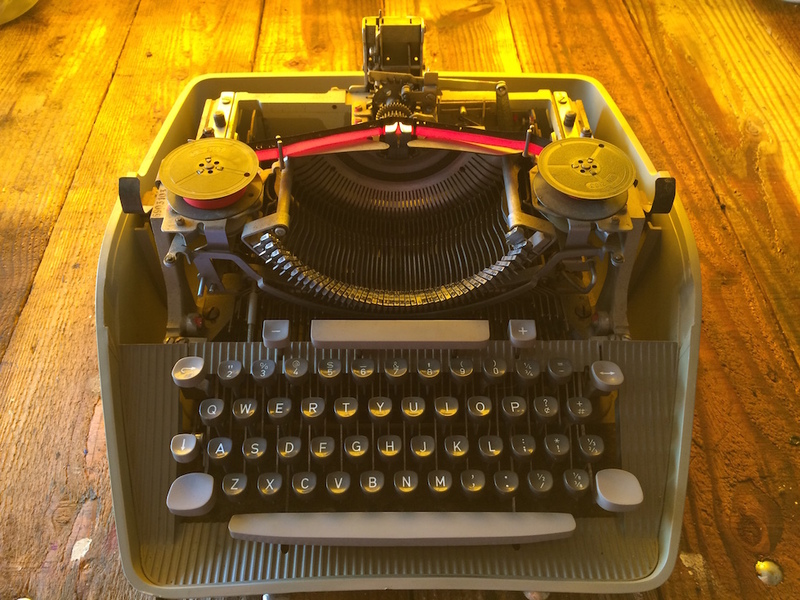 It faltered, and that chapter has faded into obscurity with nothing to show for it but a typewriter I found stuffed into the back of a cluttered antiques barn in an off-fhe-highway town called Yackandandah. John, enjoy your typewriter. I’ve left it to you to service, but I have to say it is actually pretty nice to write on. The carriage needs a good clean and de-gunk though. Digging deeper into John Lavery’s Archive. ← Shenzhen – The wild frontier no more? It’s great that you found it and have written a new chapter in its history. Great job! Thanks Steve. Just wish I had more information on the subject. Thanks Ted. If the company hadn’t gone bust so close to the buying of these typewriters, it would be harder to find out more. Also, I have updated the Typewriter Database for this item. You might notice that the serial number falls outside of the range that you have on your database – in that the serial starts with a ’69’, which designates the year it was made. However the database doesn’t show Siemag as starting their serial numbers by year till the following year.